Why is it so hard for people to wrap their head around a tie? Why is it so important to have a winner be declared? More importantly why is the crucial outcome of such events decided by a coin flip? The NFL should eliminate overtime. What is the point? Can we just for once be satisfied with two teams being equal on “any given Sunday?” Not Superbowl Sunday of course but the third Sunday in November really should not be a big deal. Should it? The winning percentages straighten themselves out at season’s end anyway to determine all divisional champions as well as Wild Card teams. They have “tie breakers” in place for any possible confusion that may occur. “Winning isn’t everything” right? I propose two things. First the NFL eliminate overtime completely from the regular season. I know I would be considered crazy to suggest it be eliminated from the playoffs and Superbowl as well so I will not go there. Regular season games will end in a tie at the end of regulation. Playoff games would be decided by letting time run out and continuing on without stopping using just the play clock until someone scores. To make it more challenging, eliminate field goal trys after regulation. Either punt or go for it on 4th down. Imagine the madness as Wade Phillips is rushing the field goal unit on to the field as time is winding down in regulation while Tony Romo and Terrell Owens are waving them off to keep running plays to try and win it in a runoff? Could you imagine that post game press conference with Jerry Jones? Second I propose the elimination of coin flips all together including at the start of the game. 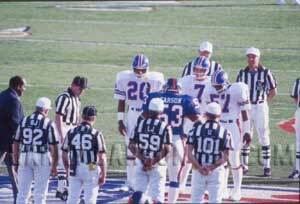 Let’s face it, every team wants the same thing: To win the toss and defer to the second half. So why not just give the road team the ball to start every game and allow the home team to choose which goal to defend? Each team will start half their games with the ball and the other half on defense. In the playoffs the same rule should apply. And this comes from a guy who bets on the coin toss before every Superbowl. TAILS NEVER FAILS!! !